For a second time in the prize’s history, The Costa Book Award has named a children’s title its Book of the Year. Philip Pullman’s The Amber Spyglass (Scholastic) was the previous children’s novel to win the award, in the 2001 competition. The Guardian quotes the winner as saying:“In the wider world sometimes children’s fiction is seen as a bit lightweight in a way that is not deserved. The fact that it has been recognised is, from my point of view, completely lovely but from a less selfish point of view I would see this recognition of the wonderful work which is being done throughout in children’s and YA writing. The chair of the final judges, James Heneage said, “Part horror, part detective, part historical, this is a fantastic story with great central characters and narrative tension.” He added that Hardinge “brilliantly articulated” the voice of a ferociously intelligent 14-year-old girl in Victorian society. By defeating the odds-on favorite—first-time novelist Andrew Michael Hurley’s gothic horror The Loney—Hardinge receives the £30,000 prize. 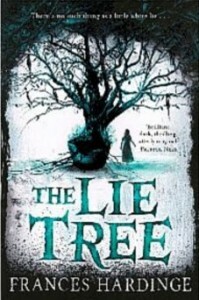 The Lie Tree is scheduled to be released in the States on May 10 by Amulet Books.